This year New Years Resolutions were really getting a bad rap. I don’t know why, most of us are guilty at not keeping them from our own accord. Last week I asked a group a friends what their New Years Resolutions were. We got to talking about how some people just don’t make any New Years Resolutions for whatever reason. One friend commented, “If you want to make changes, just do it. Don’t wait until January.” And I think she’s totally right. Just do it. Don’t wait. I would assume that the changing of the year sparks a bit of hope in all of us. We are celebrating, reflecting of the past 12 months. The pain from our failures and the fist bumps of our successes. We anticipate the following months that include our dreams, and the next chapter and seasons in our life. We already know what we need more and less of in our lives. Most people know that writing out a goal holds you more accountable. Most people know that setting a plan in place helps you take steps needed to achieve the goal. Most people know that sharing the goal, with a trusted friend or spouse creates another layer of vulnerability and trust of obtaining the goal. SO why are we so down on New Years Resolutions? Or why do they get such a bad rap. Fear, pride, laziness, comfort, and insecurities get in the way of obtaining the goals we’ve set forth. Or sometimes the timing is all wrong. Or the market is all wrong. Or everything is all wrong. As I was thinking about Resolutions, I starting to think about how we could make them for our own our Social Networks. Here’s a list of some simple resolutions you could start to implement today, regardless of network you participate in. Focus – Use this time to refocus, reprioritize the spaces you participate and engage in. And bring it. Celebration – Showcase and show off the connections, serendipity, stories. ALL THE TIME. Consistency – Engaged users engage users. Schedule it. Daily, monthly, quarterly. Focus on activities that improve the quality of your consistency. Excuses – Just ask. Just do it. Whatever you are holding back, go forth. And stop finding excuses. Is it time to ask the Director for some support? Do you want to try changing up the annual conference/meeting/kick off to include something different? Do it! Unanswered – Don’t leave anything without a comment, @mention or LIKE. Enlist others to help with this. Do something that tells the person on the other end that they are heard, valued, noticed. EVEN when you don’t have the answer. Or know the right person. Trolls – Just don’t tolerate this type of behavior. There are other places these people can be like this. OR maybe, engage them in a way that’s beneficial to the community, like giving them a project or opportunity for them to use their strengths. What do you think about New Year’s Resolutions? Do you make New Year’s Resolutions? Why? Why not? Oh! And Happy New Year from my family to you and yours! Its been a wild ride this past year and I am excited for 2017! PS. 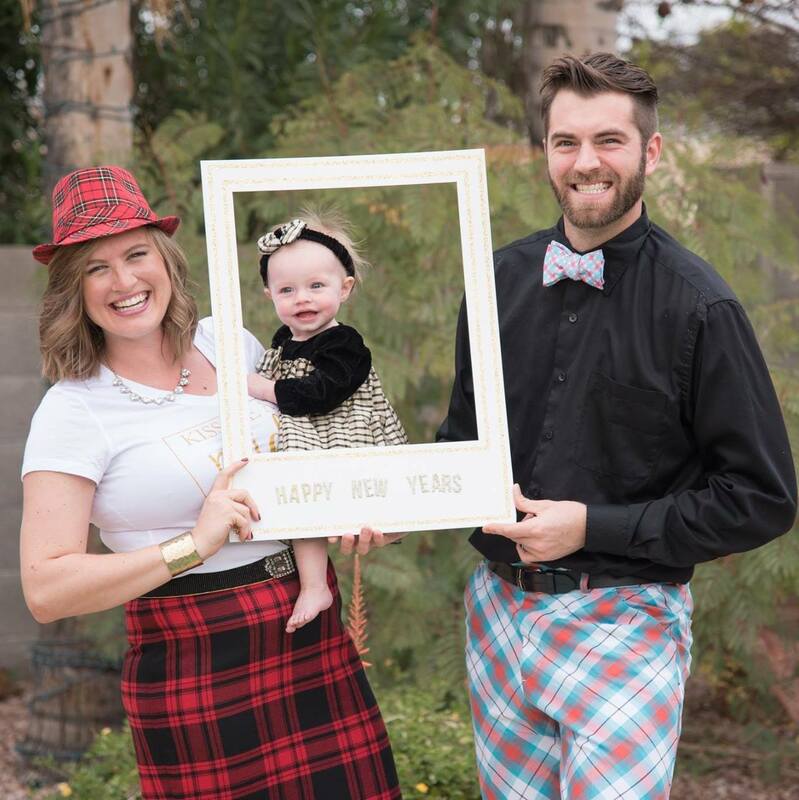 We hosted a “Mad about Plaid” New Years Eve Party, hence the plaid. HAH!